A report by the Department of Justice Office of the Inspector General reveals that Hillary Clinton directly communicated with 13 individuals using her private email account while serving as secretary of state. Clinton used an account on her domain clintonemail.com to conduct official government business while secretary of state, including sending and receiving classified information, in violation of government policy. Government officials are required to use government email accounts to conduct official business, and for the emails to be retained. In the case of Clinton, the emails were stored on a private server, which was vulnerable to hacking, and tens of thousands of emails sent on the server were later deleted by Clinton’s lawyers. The IG report reveals that then-President Barack Obama communicated with Clinton on this unsecured email server that violated government policy. “FBI analysts and Prosecutor 2 told us that former President Barack Obama was one of the 13 individuals with whom Clinton had direct contact using her clintonemail.com account,” the IG report states. The IG report also said that Obama used a pseudonym in his communications with Clinton. It is unclear what pseudonym Obama used. It was earlier revealed that Obama’s Attorney General Loretta Lynch also used an alias for email communications—in her case, on her official DOJ account. The use of aliases makes it more difficult for reporters or other groups to obtain documents using Freedom of Information Act requests. 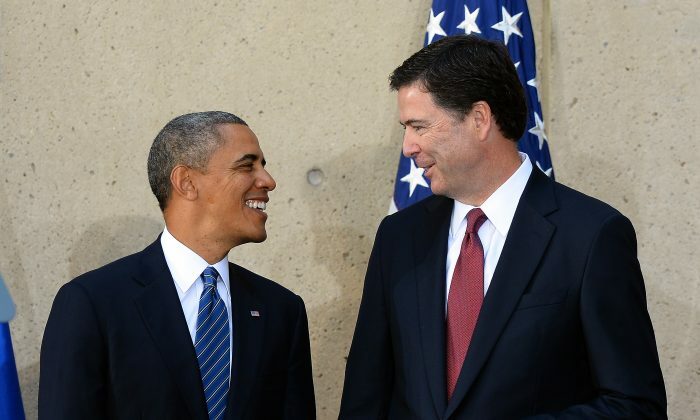 The IG report also revealed that Obama-appointed FBI Director James Comey created a personal Gmail account around the time he was appointed, which he at times used to conduct official government business. According to Comey’s former chief of staff, Jim Rybicki, Comey had not sought or received advice from the DOJ on the use of these accounts.